British love affair to shopping along the High Street is proverbial, and dates far back in time to the 1800s. So much so that Napoleon dismissed the English as a “nation of shopkeepers”. But the high streets are changing and seem to continue to diminish due to the exponential rise of e-commerce. This trend is not only happening in the UK, but in major European cities. At an article posted at to ParcelHero’s David Jinks states that between 2020 and 2030 of the UK’s existing shop premises might perish. 100,000 stores have the potential to close, which means that will have only 120,000 shops on our high street. The reason why? 2030 e-commerce will account for around 40 per cent of all UK retail sales. A recent study done by GlobalData came to the conclusion that major retailers including Marks and Spencer, Debenhams, New Look, and now potentially Arcadia, are closing a significant number of stores over the next three to five years, and town centres will be the hardest hit locations with clothing and footwear spend forecast to decline by 13.8% (£2.4bn) between 2018 and 2023. 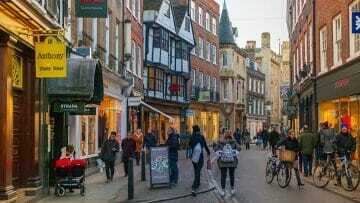 Anchor retailers like Marks & Spencer and Debenhams exiting secondary and tertiary town centres will result in other retailers suffering due to reduced footfall as consumers fail to consider their high street as a worthwhile shopping destination and instead go elsewhere. GlobalData’s survey of 2,000 UK respondents conducted in February 2019 showed that 40.6% of consumers would choose to shop online if the retailer they usually shop with closed the store they normally purchase from; thus demonstrating how store closures boost online penetration. Essential purchases will prop up high streets as the convenience of the location – which 80.5% of UK consumers visited in the last 12 months, according to GlobalData’s 2018 survey of 10,000 shoppers – will remain appealing for purchasing items such as food & grocery and health & beauty, where a wider retailer and product choice is less important in comparison to clothing & footwear.